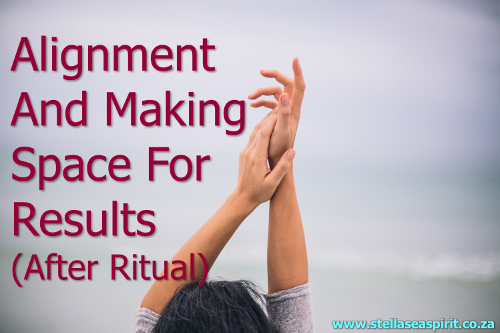 This post is particularly appropriate for that eager time lapse after you have performed a ritual or spell and you’re anticipating the result! Like attending a formal dinner party at a prestigious establishment, you’re feeling really excited but you know you have to tone it down a notch to vibe serene for gracious admission. Sometimes you have difficulty detaching from your wants and can’t stop thinking about when you will see it take effect or projecting all the potential scenarios through which it can come to be. Then you need to breathe and make etheric space for cosmic winds to twirl around you. Sometimes your circumstances don’t budge (expand) until you make space in other areas of your life which creates a variety of pathways along which your manifestation can be delivered to you. How do you craft “space” in your life? By taking action of course! Visualise roads opening and blocks dissolving. Chant uplifting mantras, exercise to move energy through you. And then there is good old housewitchery; rearrange the furniture, clean out cupboards, organise your desk etcetera. On recognising patterns… start noticing recurring dreams or imagery and playfully leaning into the potential messages for you. Look up number sequences that keep showing up like 1222 or 1414. Logical scrutinising can only take you so far, sometimes you just have to surrender into feeling and intuition. Get present in the present and practice letting go of self-judgement whenever it surfaces. >> The less you reach for results the better things go. For example, don’t let fear define your actions, as in worrying about missing out. “If I do go I might…” or “what if I don’t go and…” Just lean into it and listen to that still, sure voice within for guidance. Avoid trying to will it to happen or push things into place. Relinquish controlling the storyline (and timeline). The best approach is to consciously “forget about it” and carry on as if it already happened and matter is just catching up with spirit. Because most often, the universe tends to deliver when you’re not looking or through the secret door you didn’t even know existed. Utter thank you for everything in your life, even the flashpoints. Say “I love you” to yourself speaking directly to your heart centre. Savour simply being here and getting to play human in Gaia’s vast array of treasures.